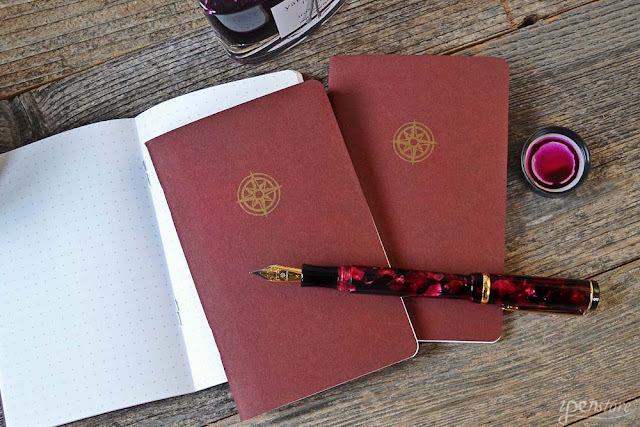 We are pleased to introduce our newest addition to the Rosetta brand - Rosetta Notes fountain pen friendly pocket notebooks. Customers regularly tell us they love using pocket notebooks, but the popular brands on the market use paper that is not fountain pen friendly. So, we decided to manufacture our own line of pocket notebooks. We researched and tested hundreds of paper stocks to come up with the ideal paper for fountain pens. So, we decided to manufacture our own line of pocket notebooks. We researched and tested hundreds of paper stocks to come up with the ideal paper for fountain pens. We chose to go with an old friend of our family business - French Paper in Michigan. French Paper has been made in Michigan since 1871. Our history with French Paper goes back to the 1950s when we purchased duplicator paper for the Chicago public school system. They are one of the last American small independent paper mills. 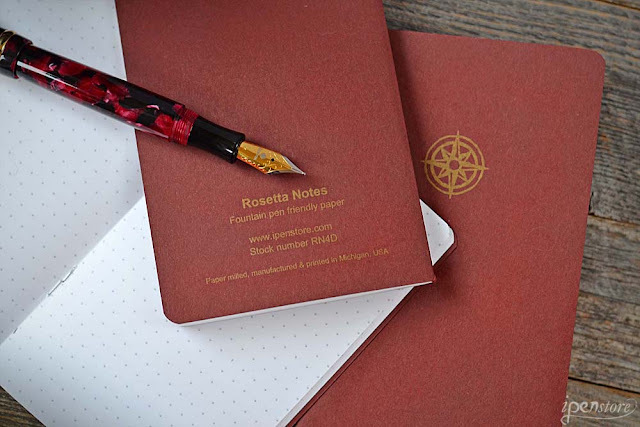 Rosetta Notes pocket notebooks by Rosetta are made with French Paper 70# Smart White text paper that is perfect for use with fountain pens and 2-sided writing. The covers are made of 100# recycled paper cover stock (260 gsm) in a deep wine color. These journals are perfect for writing and drafting on the go with pencil, ballpoint pen, fountain pen and markers. 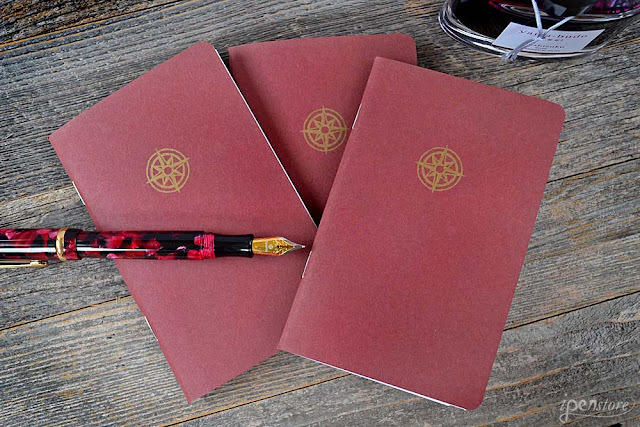 Pack of 3 staplebound notebooks. 3-1/2" x 5-1/2" (89 mm x 140 mm). Dot grid is 5 mm. Each notebook has 24 sheets (48 pages) of heavy (105 gsm) bright white, pH neutral, acid-free paper for archival quality. Smooth, satin fountain-pen-friendly finish. Rosetta Notes are milled, manufactured, and printed in Michigan, USA. iPenstore exclusive. 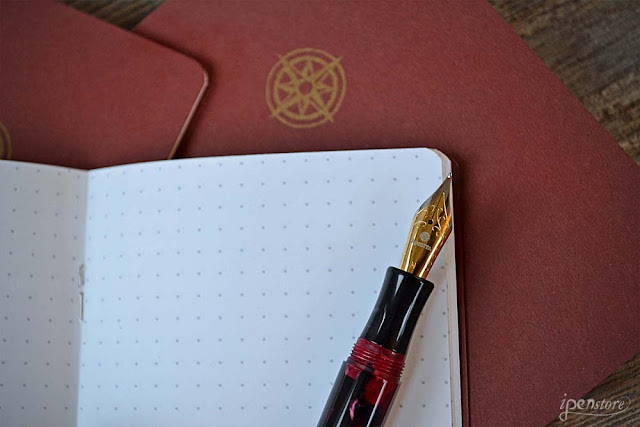 This month, we're introducing the Dot Grid version - consistently the most requested version of pocket notebooks. Next month we're introducing the Blank paper version (sneak peek - the February iPenbox will have a sample!) Then, the Lined and Graph versions will be released in March. Pricing is $8.97 per pack of 3. What model pen is shown in the photos, please? It looks excellent. That is the Rosetta Magellan fountain pen- we are expecting a shipment of them next week. 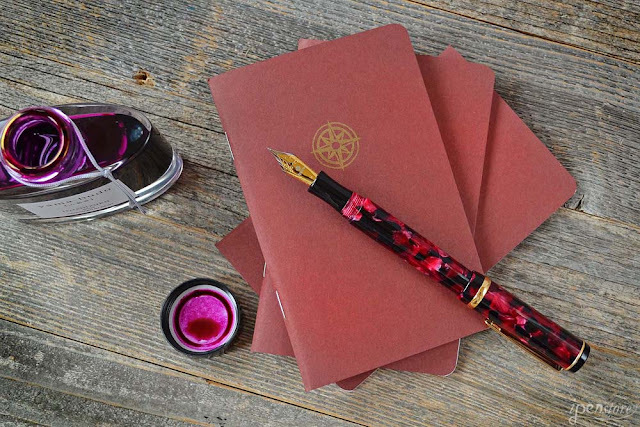 The Rosetta Magellan fountain pens are now in- we are automatically sending a free Rosetta Notes pocket notebook with every purchase of the Rosetta Magellan fountain pen.